I do love an intriguing parcel and even more so when it turned out to contain a clever invitation. 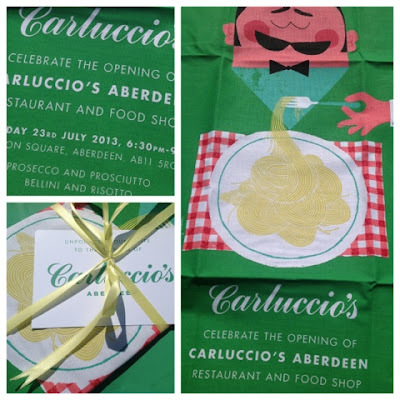 All packaged up in a green envelope was a Tea Towel inviting me along to the launch of Carluccio's Restaurant and Food Shop in Aberdeen. The promise of Prosecco and Prosciutto, Bellini and Risotto was too good to miss. 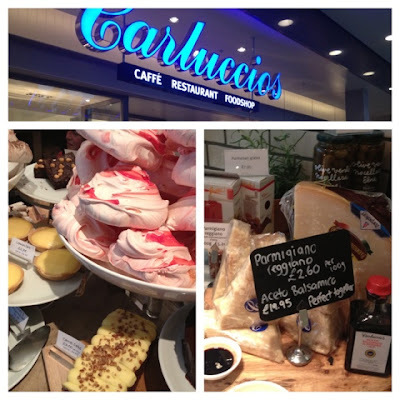 Having just returned from a fortnight's holiday in Tuscany where the food and drink was truly amazing, Carluccio's had a lot to live up to. First impressions were very good as the small food shop located immediately upon entering was a real Aladdin's cave of Italian foodie goodies. 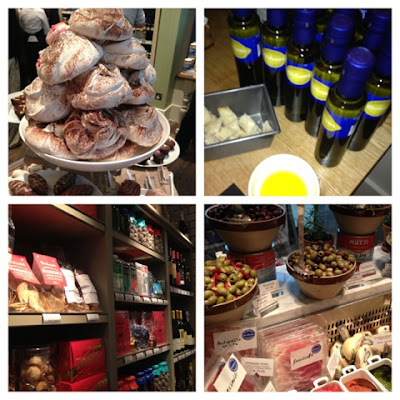 Giant meringues, tantalizing bowls of olives, cheese, oils, vinegars and much more. Plenty of tasters too and all the staff seemed very knowledgeable about the products on offer. The restaurant is open daily from 8am and the breakfast/brunch menu looks very tantilising. Open until 11pm the philosophy is very much that you can eat whatever you want from the menu whenever you want. The Prosseco and Peroni was flowing although alas no sign of the promised Belini. Waiting staff circulated with delicious canapes including Parma ham wrapped grissini and Arancini di Riso (crispy rice balls). Antonio Carluccio himself was at the opening and gave a heartwarming humour filled speech. He was dressed for the occasion in natty tartan trews. Earlier in the day he had even gamely tasted the Aberdonian delicacy of the Rowie and the notorious deep fried Mars Bar. That must surely be akin to the Chip Pizza and Nutella Pizza we "enjoyed" in Tuscany. 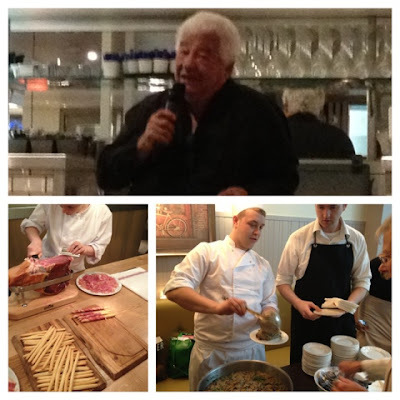 Too good an opportunity to miss a celebrity photo with the Godfather of Italian food. 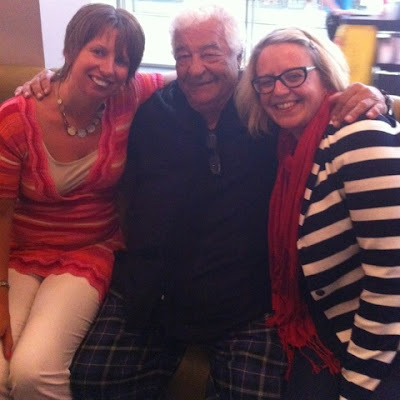 Here's the man himself giving me and Karen from Blow Your Own Crumpet a great big Italian hug. 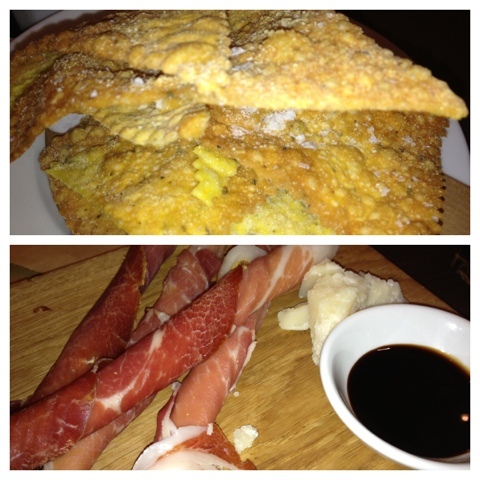 PROSCIUTTO E PARMINGO - Parma ham wrapped grissini and Parmesan chunks served with aged balsamic vinegar to dip. PASTA FRITTA - Pasta "crisps" with herbs and sea salt. Both dishes were fantastic. The aged Balsamic was thick, syrupy and full of flavour. My favourite however were the pasta crisps. Think I'm going to experiment myself and have a go at making some of these. 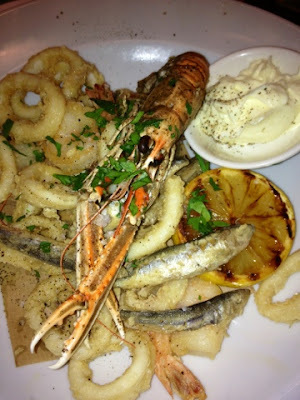 FRITO MISTO - A seasonal mix of crispy calamari, whitebait, prawns and langoustine. Served with garlic mayonnaise. SPAGHETTI CARBONRA - The modern classic dish of spaghetti, egg and smoked pancetta. SPAGHETTI ALLE VONGOLE IN BIANCO - Neapolitan spaghetti with whole fresh clams, garlic, herbs and chilli. TORTELLONI DE CERVO - Handmade fresh tortelloni filled with wine braised venison. Girl asked for Gnocchi with Butter and Parmesan Cheese which wasn't on the menu but was no problem for the kitchen to create. Unfortunately something went wrong at this point and our main course order never reached the kitchen meaning a lengthy wait until this was discovered and rectified. The staff dealt with this really well apologising, keeping us informed and bringing a round of complimentary drinks (they also knocked two ice creams and coffees off the final bill). When our mains did arrive they were definitely worth the wait. 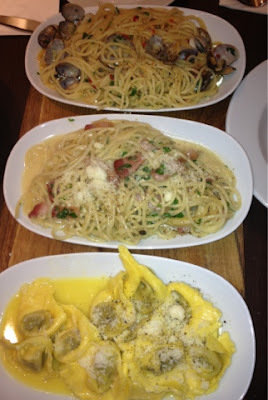 The pasta dishes to share were more than enough for two and were all equally good. The wine braised venison in the tortellini was something special. My seafood was crispy and delicious and girl declared her gnocchi as good as we had on holiday. Absolutely loved both my Launch and Lunch Carluccio's experience and will be returning again soon. Might bring along my tea towel next time and see if I can claim that promised Belini. Oooh lovely, not sure if it makes me want to head to Aberdeen or Italy first! Those Pasta Crisps sounds heavenly!